Stinking Bishop is a Washed Rind Cheese that looks a little like Munster. The Cheese is washed in Perry, which is made from the Stinking Bishop Pear. Its wonderfully aromatic, and the smell is much stronger than its delicious mild taste. Stinking Bishop is perfect for impressing dinner guests. Very limited stock. Why not buy a Baby Stinking Bishop; they make great gifts? See below. 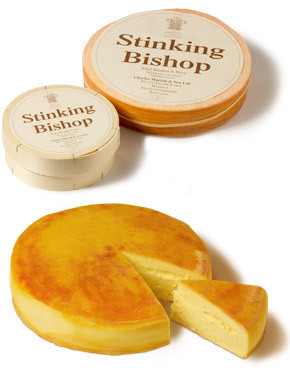 Stinking Bishop is a washed rind cheese dating back to the Cistercian monks. Stinking Bishop is washed in fermented pear juice (also called "Perry"), and the cheese develops a stinky, pungent, orange-colored, sticky rind as to get technical, Brevibacterium linens ripen the cheese from the inside out. Produced by the infamous Charles Martell, in Dymock, the Gloucester cheesemaker of some distinction, who besides producing great Double and Single Gloustershires, also has an enthusiasm for Perry. This interest led to Charles tracking down numerous old Pear varieties and the creation of the first national collection. During the cheese-making process the curds are washed in perry before being ladled into moulds. To increase the moisture content and to encourage bacterial activity, salt is not added until the cheeses are removed from the moulds. The cheese is then washed in more perry as it matures. This process takes six to eight weeks. Today, his best known cheese, Stinking Bishop, brings these two interests together, since it's curds are washed in perry. There's no doubt that Martell has created a cheese of some distinction, smelly for sure, not disimilar to Pont L'Eveque or Epoisses, but with a delightful taste – sweetish and, despite what the smell might suggest, actually not overwhelmingly strong. Martell was interviewed on Radio 4's Today Programme at the launch of the famous Wallace and Gromit film in 2008. Asked about the likely impact of Stinking Bishop cropping up in film, he said he didn't really want to sell more or he'd have to employ more people and that would mean building a bigger car park! BUT, demand for the cheese increased sharply with release of Aardman Productions' animated movie "Wallace and Gromit and the Were-Rabbit", in which Gromit uses the smell of Stinking Bishop cheese to revive Wallace at a village event, by holding it under his nose.